Ghost Pipefishes are some of the most passed by and—at the same time— sought-after animals in tropical oceans. They are passed by because their cryptic nature and fantastic camouflage make it likely that divers will not see them even when looking right at them; they are sought after because once you train your eyes to find them, their beauty and visual extravagance are captivating. The Steinhart Aquarium’s male Solenostomus paradoxus behind the female, soon after their trip to San Francisco from the Philippines. 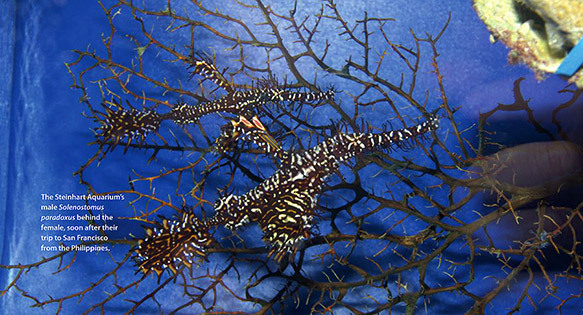 The overwhelming consensus among saltwater aquarium keepers is that Ghost Pipefishes are impossible to keep in captivity. Over the years we have developed a healthy sense of skepticism when it comes to the old warnings about animals that should simply be “left in the ocean.” This skepticism stems from an understanding that much of the time these animals are simply not given the specialized care they need to survive. Of course, a shy, difficult-to-feed fish placed in a well-stocked reef aquarium will fail to thrive. However, recent work with the Orangespot or Harlequin Filefish (Oxymonocanthus longistrosis), Purple Queen Anthias (Pseudanthias tuka), octopus, cuttlefish, Acropora, and a whole host of non-photosynthetic corals has shown that, although they require a bit of specialized work, these once seemingly impossible animals can not only live but thrive, and sometimes even reproduce, in captivity. 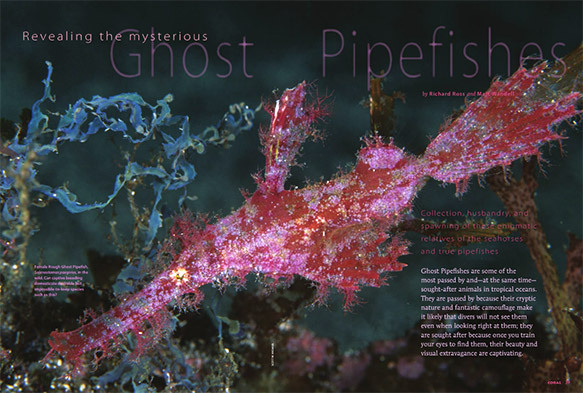 Why should the Ghost Pipefishes be any different? There are three criteria needed for success with “difficult to keep” animals, though satisfying all three can be easier said than done. I recently just made my own article on this email me if you would like to see it.